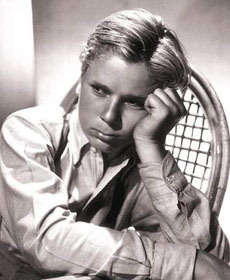 Child star at MGM and "Little Rascal" in the early talkie era, nominated for an Oscar at the age of nine. He later had a successful career as a director, and played Daily Planet editor Perry White in the Christopher Reeve Superman movies of the 1970s and '80s. Hollywood Walk of Fame 1501 Vine St.
Broadway to Hollywood (1-Sep-1933) · Ted Hackett, Jr.